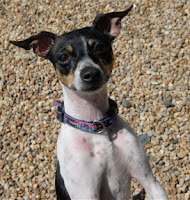 The Rat Terrier is back with her owner after spending a week at the shelter, thanks to the efforts of the editor of the Dover-Sherborn Press. We sent her the dog's photo and asked if she would run it in this week's paper and when she replied, she mentioned that the Needham Police had a report of a stolen Rat Terrier. After a few phone calls, owner and dog were back together again!